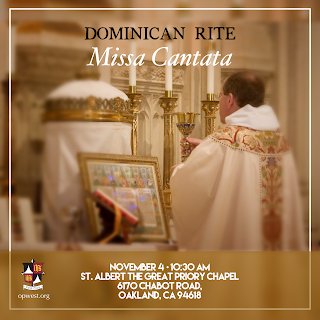 A Dominican Rite Missa Cantata will sung at the Priory of St. Albert the Great, the house of studies of the Western Dominican Province in Oakland, CA, on February 3, at 10:30 am. This will be the first of the Dominican Rite First Saturday Masses of Spring semester, 2018. The celebrant will be Fr. Augustine Thompson, O.P., Professor of History at the Dominican School of Philosophy & Theology. The servers and schola will be composed of student brothers of the Western Dominican Province. The coming Dominican Rite Sung Masses for the First Saturday Devotion will be celebrated on March 10, April 7, and May 5.